This is our third Referrals contest and this contest will last only for 10 days. Even a single referral you bring can make your username appear in the below table. So try and get as many as referrals you can. 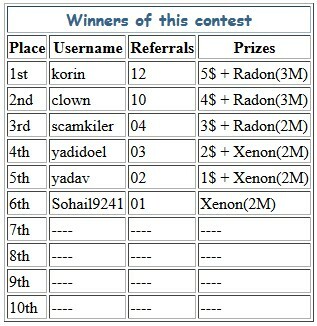 The Prizes for this contest are listed below. Paid to Sign Up offers[PTSU] or MicroJobs are not allowed to bring referrals, they will not be counted towards this contest. You are not allowed to register multiple accounts with the same IP. If any one is found Violating our TOS, then they will be banned from this contest. Please don't promote your referral link with hidden ID as it has some problems, very sorry for that. If you have already promoted then don't worry because we will inform as soon as you get any referral with hidden id. admin i got one referrals. ! the table will be updated soon! I have 6 refferals, why not i am in contest ? (05-19-2015, 09:22 PM)Ciprianvas Wrote: I have 6 refferals, why not i am in contest ? 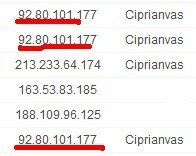 It's because from same IP address 3 accounts were registered and you were the sponsor. So, you are disqualified form this contest.